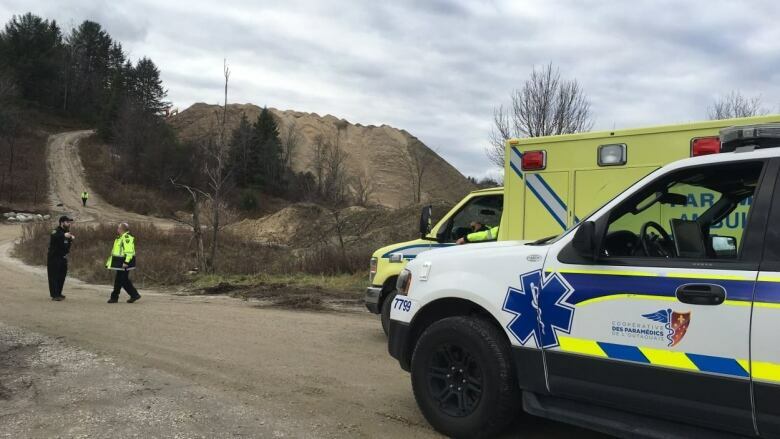 One week after a western Quebec man died when his excavator was swallowed in a landslide, police say crews have finally been able to recover his body. Daniel Dompierre was operating an excavator at a La Pêche, Que., quarry when the landslide happened at around 10 a.m. on Nov. 1. Emergency crews were able to briefly reach Dompierre's body to confirm the 31-year-old Bouchette, Que., man was dead. However, the ground was initially too unstable to begin recovery efforts, and they were forced to wait for an engineering report giving them clearance. On Thursday afternoon, MRC des Collines-de-l'Outaouais police said the site had been secured and that the work to bring Dompierre's body to the surface would soon be underway. Shortly before 3:30 p.m., police said Dompierre' body had been successfully removed from the excavator. An engineering team from Montreal with experience in similar incidents, along with two avalanche experts from the Sûreté du Québec, have been on-site helping with the recovery effort. Police have said they're investigating the incident in collaboration with the CNESST, Quebec's workplace safety watchdog. The quarry is roughly 30 kilometres northwest of downtown Ottawa.